If you are looking for a suitable learning management system (LMS) for your needs, you’ve probably heard about one of the most popular solutions of this kind – TalentLMS. This system is used by more than 30,000 organizations including The University of Arizona, Acquia, Sonus, LG, and cPanel. It offers an easy learning platform to train your employees and customers. The software is also cloud-based which means you don’t need to install, backup, or upgrade anything. With TalentLMS, you can basically create e-learning courses in minutes. In this article we’ll have a look at more TalentLMS pros and cons to give you a detailed overview of its capabilities. Our experts analyzed all popular LMS systems and after a detailed test we found out that currently TalentLMS offers some of the best features and functionalities among all the services we studied. In addition to great features, the vendor offers flexible pricing plans that are suitable for the needs and budgets of both small and large enterprises. There is also a great free trial plan which gives you the opportunity to test drive the app’s features free of cost. With it you can check out all the main benefits and better understand how the software can boost your business. You can easily sign up for TalentLMS free trial here. TalentLMS is customizable to your needs with your own custom domain, theme, and logo. You can design your account to look the way you want it. The system offers simple and comprehensible analytics to help you learn about what’s happening within your e-learning environment. It is also an enterprise-friendly LMS that offers an encrypted and secured channel for all data communication. 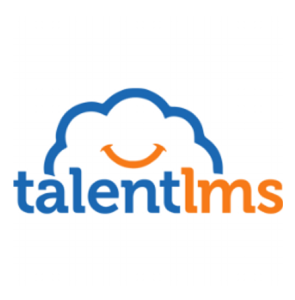 TalentLMS is a powerful system that offers support for notifications, SCORM, extensible user profiles etc. The software is easy to maintain which gives you more time to focus on delivering effective online training. It is built to work with Android devices as well as iPad/iPhone. What makes TalentLMS the preferred choice of thousands of organizations? Read on to learn more about the numerous TalentLMS features, advantages and benefits offered by the software. The software has a simple and minimalist interface that users will love to use. It is easy to learn and adopt even by laymen and allows you to use time effectively by building courses in minutes. Proficiency can be achieved in less than an hour. Navigation is intuitive and you can find and use features easily. The vendor has learnt from both enterprise and school best practices and experiences, so TalentLMS clearly knows what is required to deliver effective training. You can easily get started by logging in with your ID and customize the app to your requirements. All the content you create is automatically backed up and made available for offline usage as well as insightful analysis. TalentLMS offers you the chance to monetize your courses easily and profitably. It allows you to create an unlimited number of courses that can be sold to an unlimited number of users. You can use their marketplace to sell (and buy) thousands of specialized courses. How is this possible? The system is enterprise ready which means it can manage mass actions without users having to worry about the administrative aspect. It can easily handle yearly courses that are accessed by thousands of users. As the creator and instructor, you can decide the amount you charge, payment frequency (one-time or monthly) and whether you should offer special promotions and discounts. You can get paid through Stripe and PayPal, or design your own payment gateways if you feel like it. You can do your knowledge transfer through TalentLMS and all users can access the content in real time. It offers flexible pricing for all budgets and company sizes. You can learn more about TalentLMS pricing in our detailed review. These are only a few minor drawbacks that the vendor could improve to make the software more robust and effective. None of these have any direct impact on the performance of the service, which remains one of the best we’ve seen so far among LMS solutions. Our evaluation of TalentLMS pros and cons leads us to believe that it’s currently the best learning management system you can get. You are guaranteed to improve your training and educational processes by investing in this learning management system. The vendor offers suitable pricing plans that can be utilized by companies of any size and in any industry. There is also an excellent free trial plan that gives you the chance to gauge how the software can benefit your company. You can easily register for TalentLMS free trial here.